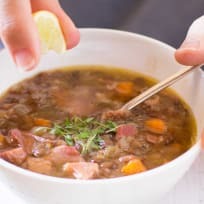 German Lentil Soup is popular in super Japan. Perfect for chilly soup weather! This Japanese tofu hamburger is a special take on the hamburger. Added tofu makes it extra moist and delicious! 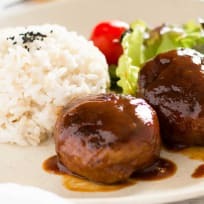 Mabo harusame is an easy, flavorful dish you’ll love! It’s great for busy weeknights or even lunchtime. 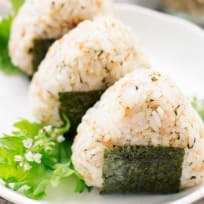 Onigiri are a staple food in Japan. You’ll love how easy they are to make at home! Chirashi zushi is still sushi – just super easy sushi. There’s no rolling. Think of it as deconstructed! Ebi Katsu Don is a sweet, savory rice bowl dish anyone that loves Japanese food will enjoy. It’s light enough to have for lunch too! Japanese sweet potato roasted and served with sweet honey butter. Could there be a better side dish for poultry, beef or pork? Chicken creamed stew has become a Japanese staple. Use the veggies you have on hand for a hearty meal. Spinach ohitashi is a staple side dish in Japanese cuisine. This savory side is a nice change from your typical spinach salad! 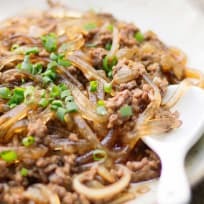 Kakiage don is a delicious Japanese rice bowl dish. Tempura vegetables are served over rice for one wonderful meal! This Asian chicken salad with sesame dressing is an excellent lunch or dinner on a busy day. It comes together quickly, but will fill you right up! Anpan is a delectable Japanese sweet bread made with red bean paste. Bake it up in your own kitchen for a taste of Japan.